Looking for an intelligent dog who gets along really well with children? Then, the French Bulldog is something that you should go for! French Bulldogs, also known as Frenchies, are the toy-sized versions of the Bulldog curated in England. The breed became really popular in Europe, especially France and hence got their name! So today I’ll be talking about French Bulldog puppies, puppy care and almost everything you need to know about the breed! These are a few things that you should consider before you buy a French Bulldog. Let’s find out more about them, shall we? Puppies are the cutest creatures on the face of the Earth, and French Bulldog puppies are exceptionally cute! Leave a comment if you agree. Right now, I’d like to share some stages of development with you and talk about how French Bulldog puppies grow into cute and cuddly adults. And, of course, I’d also like to talk about what you should expect from the puppy! Now, let’s look at all of those stages and talk about them in greater detail. Stage 1: What’s Even Going On!? Newborn French Bulldog puppies are really tiny and don’t do much besides sleeping and eating. So, for the first weeks of their lives, French Bulldog puppies can’t really see, hear or smell anything. So, what does the puppy do? Well, French Bulldog puppies during this phase of their lives start to open their eyes, respond to light, try to crawl closer to their mom, ‘play’ with their siblings, etc. But mostly, the French Bulldog puppies will sleep and eat, like I said before! The second stage for French Bulldog Puppies starts at week 3 and it’s when the senses start to develop! This means, that the puppies can now become explorers and become more adventurous. No sleeping all day, every day! And, French Bulldog puppies start recognizing their human friends at this stage of life. So, they’ll be excited to see you walk in! But, don’t bring in your friends to see them just yet. This is a really important period in the French Bulldog puppies’ development. And, any negative thing can really affect the personalities of the litter and may even cause behavioral problems in the long term. And keep the French Bulldog puppies close to their mom and siblings. 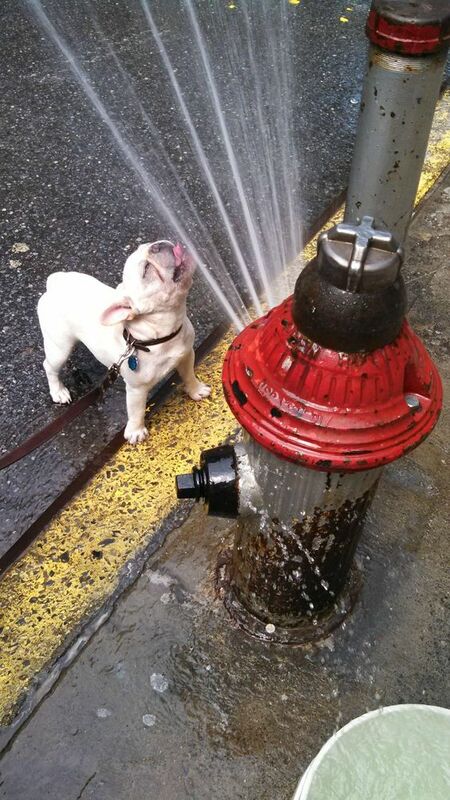 This is a crucial stage for French Bulldog puppies. This is where the social development of French Bulldog puppies takes place and the puppies learn how to play with their littermates and not bite everything in sight! And, the mother also starts weaning them off of her milk during this time. The French Bulldog puppies learn how to become dogs during this time and their mom teaches them basic doggy behavior and is treated as a leader of their pack. This is also the time when you should introduce the French Bulldog puppies to food! Their new love for life. Week 4 is probably the best time to add some puppy food to the diet as their mom weans them off. Social development is another thing that takes place during this time in puppyhood. This is the time when the French Bulldog puppies should be left with their moms and littermates. So, don’t leave them on their own for more than ten minutes! If you do, the pup can have behavioral issues later in life. French Bulldog puppies also develop social skills during this time. Now, the puppies may have few accidents around the house, they may even fight a lot with each other. But, that’s all normal behavior! Don’t punish the little pups for such stuff. During this stage in life, French Bulldog Puppies are nervous about anything and everything. From stairs to loud noises, the world is too big for the puppy and this nervousness is really a normal thing. All you’ve got to do is make sure that you aren’t really strict with the little doggies as they are already in stress. This is also the stage in the French Bulldog puppies’ lives where they get a better control at their bladder and bowel and will be able to sleep all night without having to go. This is also the stage in life here you can start training the French Bulldog puppies some of the basic commands like, stay, sit, down, etc. You can also start leash training during this time of life! And, since you’re at it, you should buy your doggy some French Bulldog collars to make your pup a little more comfortable with them. It’ll be annoying at first. Also, you should get your doggy a French Bulldog harness. I feel that harnesses are better than collars and leashes. So, I suggest that you invest in a good Frenchie harness. This is basically the onset of adolescence and you know what teenage brings, right? French Bulldog puppies like to become more independent and may even defy a few of your commands. Now, don’t take that very seriously! Don’t be very harsh with your puppy and scold him. Rather, be a little gentle with him and reinforce your puppy friends when some yummy treats to get him back on track and you’ll be great to go! And, there’s another serious hurdle that you’d like to overcome. French Bulldog puppies like biting anything and everything during this stage. You may think of it as something playful and fun, but it’ll grow into a serious problem if you don’t nip this in the bud. Don’t let your doggy get into the habit to biting humans! During this stage, French Bulldog puppies tend to become brats and really rebellious. Your puppy will have a mind of his own and will rebel a lot, and there’s nothing wrong in that! First of all, you should know that this is where your puppy will start teething. And, that’s a really painful time in your pup’s life. So, what should you do!? Well, stock up on chew toys, edible bones, rope toys and what not! This’ll really soothe your pup’s biting instinct. But, I can’t guarantee that the French Bulldog puppies won’t chew on your furniture! The puppies will try to exert some of their dominance on their siblings as well as human family members. So, you need to resolve that as well. You should make sure that you shouldn’t take your doggy off of the leash if he doesn’t obey your commands as it can even lead to death. And, just like a normal human teenager, your French Bulldog puppy will also have some hormonal changes and this is probably the right time to neuter the pups. Teething can be hard, but toys help! So, this is an awkward phase of life for French Bulldog puppies. Well, your pups look like adults but aren’t quite there yet. Your puppies will be full of life, excited to sniff new things, explore the world around them and just be dogs! This is their first step into doghood. During this phase of life, you should mainly keep an eye on your doggy’s diet and feed him the right foods for French Bulldogs. Other than that, you should also feed your French Bulldog puppies some nice treats as well, like bell peppers, tuna or even olives. Also, keep training your puppies so that they are responsible and well-behaved doggies. French Bulldog Puppies and Their History! Did you know that the French Bulldog originated from England? When bloodsports were banned in England, the ‘bulldogs’ were essentially left unemployed and they were turned to a companion breed. And then the Industrial Revolution began and lace workers from the city of Nottingham moved to France, taking their miniature bulldogs with them. And these dogs became a trend in France. While England was sending over dogs that were either too small for them or had ‘defects’. This small bulldog then started being called the ‘Bouledogue Francais’ and became highly fashionable. The dog found its way into America and was affectionately called “Frenchie”—a name that’s still in use to this day. That’s it for the quick history lesson! French Bulldog Color: French Bulldog Puppies and The Colors They Come In! French Bulldog puppies are really cute and adorable. That being said, if you’re walking down the street with your little puppy, the pup will hold everyone’s gaze. And, if you’re a guy, I’ll guarantee you that girls will come up to just to pet your little puppy. All dogs are cute, but sometimes, we all have color preferences when it comes to getting ourselves a dog. So, I think it’s time to discuss the French Bulldog color scheme. I’ve talked about french bulldog colors before, so if you’re interested in knowing more about that in detail, feel free to check it out! No, there’s no blue French Bulldog! But, keep in mind that colors aside, all French Bulldog puppies are really loving, intelligent and playful! So, French Bulldog color doesn’t really matter in the long run. It’s what inside that matters the most! French Bulldog Puppies and All About Their Size! The French Bulldog is small a companion dog with a lifespan of 11-14 years. But, that really just depends on the genetic factors and how you care for the dog. Let’s talk about the size! The thing to note here is the fact that there are no gender differences and males and females don’t differ in size. The French Bulldog puppies, on the other hand, are at a growing stage and their ideal height and weight differ from one stage to another. Gender differences are also seen in the pups! Are French Bulldog Puppies Even Right For You? Like I’ve said before, the mini French Bulldog is really cute and cuddly. But, you also need to know if they fit your life before you bring them in it! So, let’s talk about that, shall we? I’ve got a few reasons why you should be looking into French Bulldog puppies. French Bulldog puppies tend to minimally shed throughout the year, but it’s not really that much. So, you really don’t need to worry about vacuuming your house every day or about puppy hairs flying everywhere. French Bulldog puppies are really chill. It’s because you really don’t need to maintain them. No trimming needed, no stripping needed either. No, if you’re someone who’s living a hectic life and need a companion, mini French Bulldogs are your BFF! Toy French Bulldogs make good guard dogs. So, if you live in an apartment or a small house, then I feel that they’d make a great companion for you! That being said, don’t depend on this mini dog for more than just a warning sign! Because, you know, French Bulldogs are really tiny in size and can’t be as helpful as a German Shepherd. If I said that French Bulldog puppies are really active, then I’d be lying. And, you won’t believe me. So, I’d say the next best thing. Even though the Frenchie would love to just lay in bed all day and lounge around the house, they are active when you want them to be. They’ll love trips to the park and run around with you when you want them to. French Bulldog Puppies And Food? In this section, I’d like to talk about French Bulldog puppies and their nutritional needs. This is something that most people tend to ignore. So, like I discussed before, you should never feed a French Bulldog puppy normal dog or puppy food before he turns 6 weeks old. Because he needs his mother’s milk during this time. Puppies need to drink their mom’s milk because it has antibodies in it that the French Bulldog puppies need for their survival. That’s because, before the weaning process, the puppy’s’ body doesn’t make any antibodies of their own to fight off infection. Now, most people think that they should switch straight to puppy food after the weaning process. No, that’s wrong on a lot of levels. First of all, the puppy’s digestive system isn’t entirely ready for solid food. So, you should feed the doggy cerelac! Yes, they make them for puppies as well! Always keep in mind to not transition abruptly to normal dog food straight from cerelac! Make the transition really smooth and not abrupt and swift. You should feed your doggy nutritious French Bulldog food. But, don’t be afraid of feeding your French Bulldog puppies something on on the side as well! Like, olives, tuna or even bell peppers! They make really awesome treats for your bulldog! So, having puppies is all fun and games until it comes to grooming and maintenance. And then, it’s chaos, whining and whimpering. So, without further ado, let’s talk about grooming your French Bulldog puppies and a little bit about shedding, walking needs, and grooming. Well, walking your French Bulldog puppies around in the fence isn’t going to be a good idea. That’s because French Bulldogs like to be active (or they can get fat!) and they really love long walks by the late, trekking and all those other outdoor activities that you’re too lazy for. Well, get off your couch and take your French Bulldog puppies out on a long walk! French Bulldogs don’t have a long or furry coat. And, so do French Bulldog puppies. Well, you won’t have to take your Frenchie to the groomers every month or anything. All you’ll have to do with French bulldog puppies is give them a bath every month or so using a good conditioning shampoo and you’re good to go. Well, French Bulldog puppies have a short coat and don’t shed. So, you can add two and two. Yes, you really don’t need to brush French Bulldog puppies. The thing that I love about French Bulldog puppies is that they don’t shed a lot. Your pups won’t shed as much as an average dog. But, like all dogs, they do shed twice a year as the season changes. No need to vacuum your house every day! And, you can boast about your dog not shedding to your friends when they cry about theirs. Frenchies tend to have really long and sharp nails that can hurt you while you’re playing with your puppy. Well cutting the nails is an option, but things can turn bloody really soon. I prefer using a nail grinder instead. And puppyhood is the right time to start grinding! Plus, no mess and no blood. Although French Bulldogs aren’t really high-maintenance and don’t need a lot of grooming and trimming, they do need some of your attention in the health domain. You should spend a considerable amount of time on your French Bulldog puppies and try to keep them as healthy as possible. So, feed them the right food. Don’t skip the vet appointments, and always keep your Frenchie’s health a top priority. This is probably the most important thing you should care about. Dogs can’t really speak for themselves and can’t tell you when they’re feeling under the weather. So, it is up to you to observe changes in them and take care of them. French Bulldog puppies are really adorable and loving and it’s your duty to keep them alive and kicking. French Bulldog Puppies And Their Personality Traits! French Bulldog puppies have a lot of desirable personality traits. But, there is one thing that you need to keep in mind. Well, each and every puppy is different and has a different personality as well. This means that the traits that I’ve listed below aren’t true for all French Bulldog puppies, but are true for only a few of them. French Bulldog puppies are really playful and light up the room. So, grab that stick and play fetch with your mini French Bulldog all you want! Do you like being loved? Well, some dog breeds are like cats. They just don’t like showing affection! Now, that’s one thing that you needn’t worry about when it comes to French Bulldog puppies as they just shower you with affection! They’ll give you all the love you need and then some more. But, they’d want you to give them your attention as well. So, you should really take some time out for your puppies. So if you’re a lazy bum then this is the perfect doggy friend for you. Because French Bulldogs love lounging around the house doing absolutely nothing. And, they’ll also love watching an entire season of Friends on a Sunday afternoon with you. So, what I’m trying to say is that French Bulldog puppies are really chill. And, there’s nothing wrong in that! Some dogs are just really impatient. If they want something, they want it now. But, French Bulldog puppies aren’t that way at all! In fact, they are really kind, patient and loving. Isn’t that just really adorable? Let me know in the comments section below as to how you feel! Some dogs are one-person dogs. French Bulldog puppies are really good with the people. They’ll love it when you’ll have people over and try to please all of your friends and entertain them. But, always remember not to introduce your puppies to strangers right away or it could lead to social anxiety! But, French Bulldog puppies are really great with both people and other dogs. So, you may think that French Bulldog puppies are as lazy as you are, but that’s not the case. As much as they like lounging around, they’re also very athletic if you train them right. So, start hitting the gym to build a body like your dog’s. French Bulldog puppies are really good with families and kids. Yes, they can be one owner dogs and can also be great family dogs! But, during puppyhood, they can try to exert dominance over small kids, so you need to make sure to cut off that behavior and nip it in the bud. Other than that, they make perfect companions for the family guy! You should start training your French Bulldog puppies around Stage 4 and start teaching them some basic commands. But, you should know that training your French Bulldog puppies will not be all fun and games. It can be a quite difficult thing! Training should begin at Stage 4, but you need to keep a few things in mind. First of all, you should never be too harsh with your French Bulldog puppies while training and always make it seem like a game. And, secondly, you should never punish your pups! This can really have an adverse effect on your puppy’s development. And, it can also cause some conduct disorders when they grow up! Check out our tips on training the French Bulldog for more information. Having a purebred dog is good. But, at what cost? Dogs all over America are living their sad and miserable lives in Animal Shelters, waiting to be adopted in their tiny cages. Those that aren’t adopted are euthanized. Rather than getting pure French Bulldog puppies, I urge you to rescue one instead and save a life. There are many more of these rescue groups in America. Be sure to look at the French Bulldog puppies they have there before you decide to buy one. Let’s take a quick recap about French Bulldog puppies, shall we? French Bulldog puppies are really cute and cuddly, but you need to take good care of them! There are not one, or two stages of development of French Bulldog puppies, but there are seven in total! And each stage brings forward one challenge that the puppies need to overcome to become well-adjusted adult French Bulldogs. So, you need to know about all these stages to become a good human parent to your French Bulldog puppy. French Bulldogs are really colorful and have desirable personality traits. But, each puppy is different and will have different personality traits. Puppyhood is a beautiful time, so enjoy it while it lasts. Do you have any questions? Suggestions? Please share in the comment section! My French bulldog puppy is 5 months. I have a problem with him bitting my other dogs ears, jumping and chewing on them. I can not get him to stop. Any suggestions?